Vinny Pazienza had quite the career, winning major world titles in the lightweight and junior middleweight divisions before sustaining a broken neck in a car accident shortly after he stopped Gilbert Dele in the 12th round to win the junior middleweight championship in October 1991. Pazienza was told he might not ever walk again. Not only did he walk, he came back and boxed over 10 more years. It’s the stuff movies are made of, so the movie of Pazienza’s life – entitled “Bleed For This” – will be released in November. Playing Pazienza will be Miles Teller. Martin Scorsese is one of the film’s executive producers. Check out the trailer. Andy Vences of San Jose turned pro in October 2012, when he was 21. Nearly four years later, he is 15-0 with 10 knockouts. But he’s 25, so if he’s ever going to really make a run at something of substance, he’s going to have to step on the gas a little bit because he’s still fighting eight-rounders. Vences will try to take a step in that direction when he takes on Moises Delgadillo of Mexico in the junior lightweight semi-main event July 9 at Tachi Palace Hotel & Casino in Lemoore (on UniMas). It’s still just an eight-round fight, but he’s slated to fight again on Sept. 10 at the same venue, which would give him three fights in 2016 with the ability to have at least one more before 2017. Vences said the focus in training camp has been to get stronger and faster, and he’s anxious to display the progress he’s made in those areas. What Vences would seem to need to do after this fight – assuming he’s victorious – is tangle with better opposition. Delgadillo is just 15-15 -2 with eight knockouts. Still, Vences is taking Delgadillo seriously. Jarrell Miller of Brooklyn is looking to make a name for himself in the heavyweight division. Although he has a record of 17-0-1 with 15 knockouts against very mediocre competition, he apparently realizes that this game is about a lot more than just power. This past Saturday’s heavyweight title fight between champion Anthony Joshua of England and Alhambra’s Dominic Breazeale showed Miller that, if he didn’t already know it. Breazeale was 17-0 with 15 knockouts when he stepped into the ring with Joshua, and Joshua stopped Breazeale in the seventh round. Breazeale’s lack of technique – he didn’t don the boxing gloves until he was 23 – was evident, especially when compared to Joshua’s. Miller, 27, is ranked as high as No. 8 in the world by one governing body and No. 9 by another. He stands 6-foot-4. Kassi is 0-3-1 in his past four bouts. But the losses were to Amir Mansour, Breazeale and Hughie Fury; the draw was against contender Chris Arreola. Kassi (18-5-1, 10 KOs) seems unfazed by Miller’s accomplishments. Light heavyweight champion Sergey Kovalev of Russia has become one of the top pound-for-pound fighters in the world and, along with middleweight champion Gennady Golovkin, one of the scariest. Kovalev on July 11 in Russia will defend his three titles when he takes on Isaac Chilemba of South Africa (on HBO). Kovalev, who is tentatively slated to then defend against former super middleweight champion Andre Ward on Nov. 19 in Las Vegas, is 29-0-1 with 26 knockouts. Check out some of his work on this video courtesy of HBO. Showtime’s series “ShoBox: The New Generation” will celebrate its 15th year with a four-fight telecast July 22 from Foxwoods Resort & Casino in Mashantucket, Conn. And the headliner could be a good one. In it, Adam Lopez (15-0, 7 KOs) of San Antonio puts his undefeated record on the line when he tangles with once-beaten Roman Ruben Reynoso (18-1-1, 7 KOs) in the 10-round super bantamweight main event. Lopez, 25, sets up the bout by suggesting he may have to avoid some haymakers from Reynoso. Reynoso, of Argentina, has never fought in the U.S. He’s hopeful a victory will earn him some big rewards. Mario Barrios has come a long way in a short time. At age 21 and just 2 1/2 years into his pro career, he is 15-0 with eight knockouts and ranked as high as No. 12 by one governing body. Barrios on July 9 will take on Devis Boschiero (39-4-1, 21 KOs) of Italy in the super featherweight main event at Sun National Bank Center in Trenton, N.J. (on ESPN). Boschiero is ranked No. 8 in the same poll that ranks Barrios. Considering the division in which Barrios toils, he needs to make a statement every time out because it is brimming with ferocious talent. Barrios gets that. Former super middleweight champion Andre Ward appears headed for a showdown with light heavyweight champion Sergey Kovalev, as the two are slated to tangle Nov. 19 at T-Mobile Arena in Las Vegas. 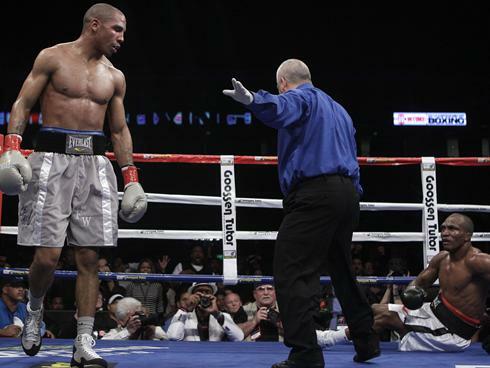 However, both fighters first must get past other opponents and Ward’s next one was announced Tuesday. Ward will take on Alexander Brand (25-1, 19 KOs) of Colombia in the main event Aug. 6 at Oracle Arena in Ward’s native Oakland (on HBO). Ward, 32, is in can’t-wait mode. Ward (29-0, 15 KOs) currently fights under the Roc Nation Sports banner. Its COO – David Itskowitch – knows how important it is for Ward to stay focused on the task at hand so as not to upset the apple cart. Ward and Brand were supposed to fight in November, but Ward had to pull out with a leg injury. Kovalev will defend his three titles against Isaac Chilemba of South Africa on July 11 in Kovalev’s native Russia (on HBO). Mikey Garcia has not fought in nearly 2 1/2 years, no thanks to contractual issues with his former promoter – Top Rank Inc. Don’t look now, but Garcia is back and the ultra-talented former world champion will make his long-awaited return to the ring when he takes on Elio Rojas on July 30 at Barclays Center in Brooklyn (Showtime). Garcia was one of the top pound-for-pound fighters in the world before his long layoff, having won world titles in the featherweight and super featherweight divisions while going 34-0 with 28 knockouts. Suffice to say, he can’t wait to get back in there. Garcia last fought on Jan. 25, 2014 when he defended his super featherweight title with a unanimous decision over Juan Carlos Burgos at Madison Square Garden in New York City. Garcia and Rojas (24-2, 14 KOs) – a former featherweight champion from the Dominican Republic – will fight underneath the featherweight title fight between champion Leo Santa Cruz of Lincoln Heights and Carl Frampton of Northern Ireland. Light heavyweight champion Sergey Kovalev has not fought in his native Russia since December 2011, a year and eight months before he won the first of his three belts. Kovalev will bring those titles back home when he defends them against Isaac Chilemba on July 11 in Ekaterinburg, Russia (on HBO). Kovalev is training outside of the U.S. for the first time since beating Nathan Cleverly in August 2013 to win his first belt. Since he likes training at altitude, Kovalev recently completed the first phase of his camp at the mountains of Armenia. Kovalev liked that the Russian national team was training nearby. Kovalev, 33, is 29-0-1 with 26 knockouts. Chilemba, 29, is from South Africa. He is 24-3-2 with 10 knockouts and has very little chance of defeating Kovalev, who has a knockout ratio of 87 percent. It was good for Oscar Molina of Norwalk to get some national television exposure. Unfortunately for him, he couldn’t take advantage of it. Molina this past Saturday faced another undefeated junior middleweight – Jarrett Hurd – underneath the welterweight title fight between Keith “One Time” Thurman and Shawn Porter, won by Thurman via narrow decision at Barclays Center in Brooklyn (on CBS). A victory would have been the biggest of Molina’s career, but he was stopped in the 10th round by Hurd. Molina didn’t agree with the stoppage. But he was well behind on the scorecards, so he wasn’t going to win, anyway, unless he somehow managed to stop Hurd in that final round. Molina was decked in the first round. He said he wasn’t in trouble then, either. Molina blamed himself for not being able to figure out Hurd’s defense, thus resulting in Molina smothering his own punches. He vowed to return in better form. Molina is now 13-1-1. Hurd, of Accokeek, Md., is 18-0 with 12 knockouts.